We have two types of minds in thinking according to Kahneman: the fast and unconscious mind and the slow and conscious reasoning. Typically, we refer to these as system 1 and system 2, respectively. The idea is that system 2 is more logical and rational. Hence, for decision making, you want to be in system 2. 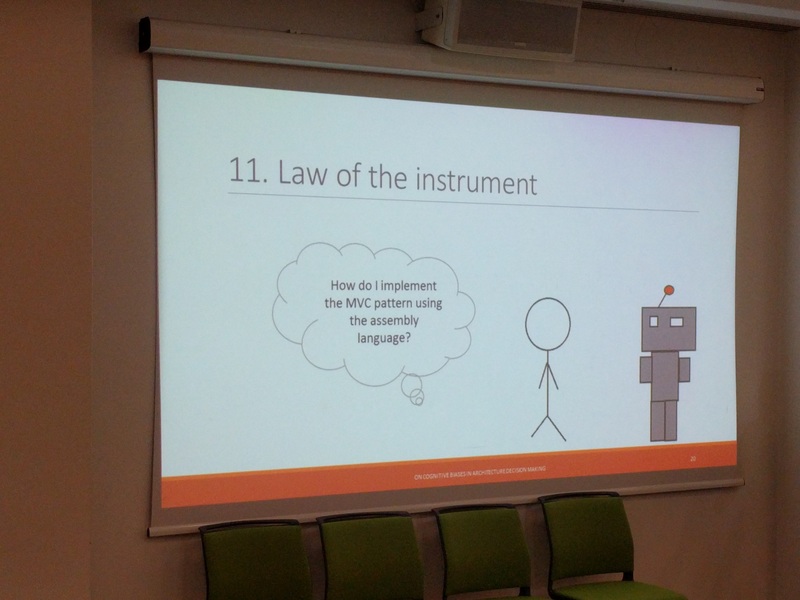 Cognitive iases however are situated in system 1. These are predictable errors in the way that individuals interpret information and make decisions. 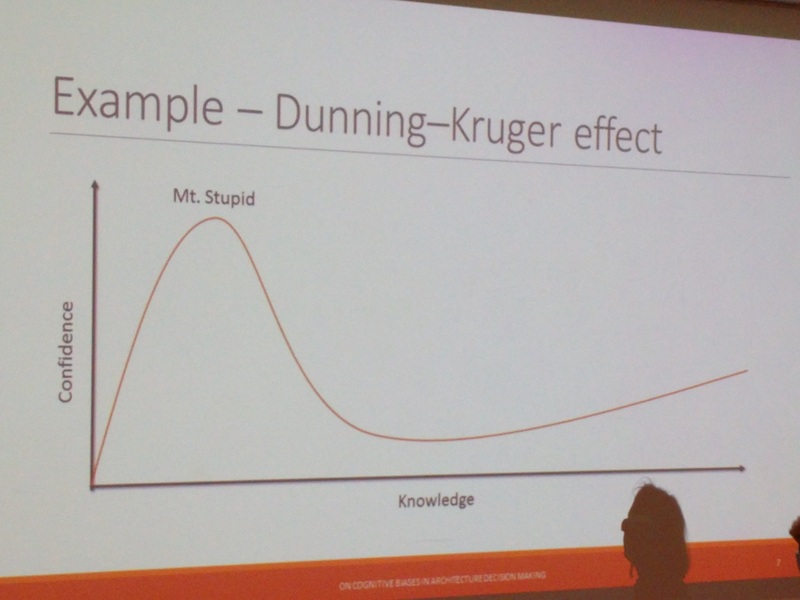 The Dunning-Lruger effect is a nice example of this; first people are very confident, but as soon as they know more, they realize they don’t know that much, and the confidence goes down. So, the fundamental question is, how much rational is architecture rationale? Are architectus IT-ECONS (fully rational egoists) or real human beings having satisficing behavior. So, how much is system 1 architecting and how much is system 2 architecting? For example, if you look at ATAM, a lot of effort is put into getting people into system 2. 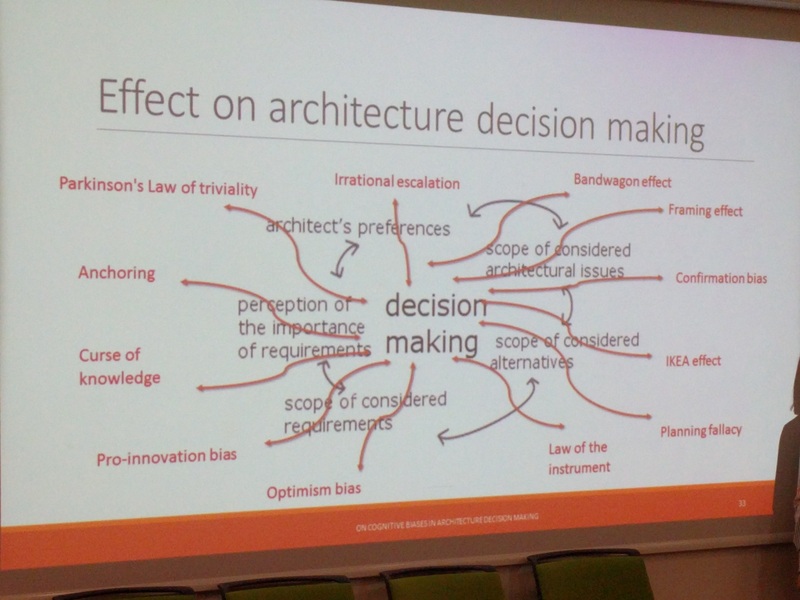 The study focuses on “are biases in architecture decision making common?”. In particular they want to know which are the most significant? and what exactly can bias decisions made by architects? To do so, they invited 8 novices (1-2 years experience) and 6 experts (>10 year experience). They organized a workshop explaining cognitive bias, writing down all biases the participants encountered, and weighted these. From the workshop, they saw that all noticed biases, but the novices less than the experts. 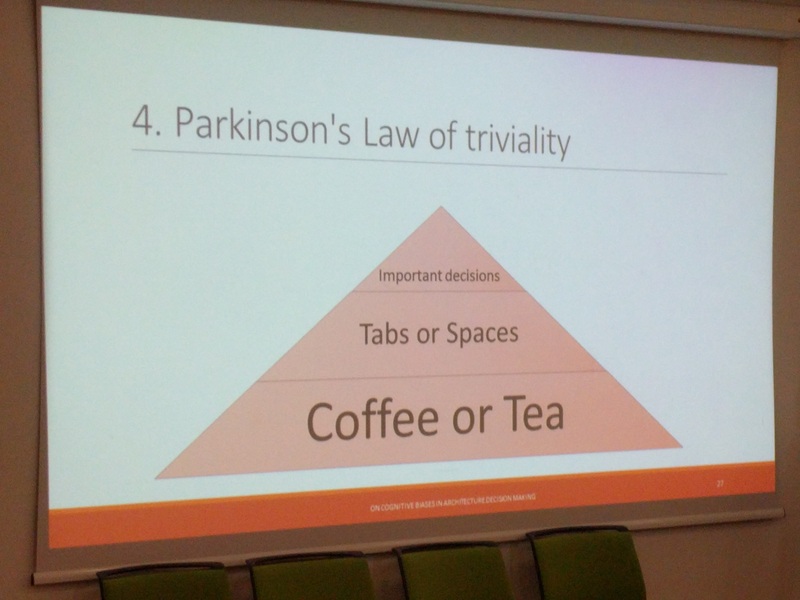 Also they experienced the Parkinson’s law of triviality: most time goes into discussing the trival tasks, rather than the important tasks. 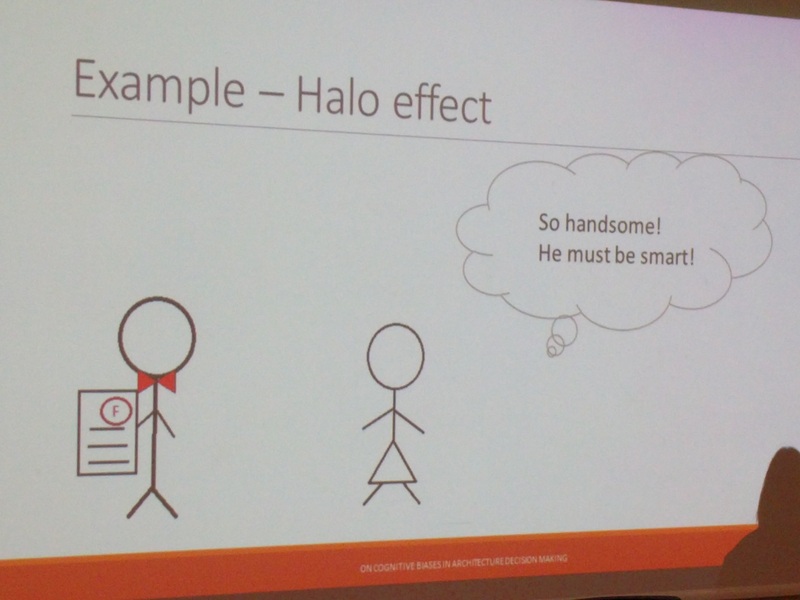 But amazingly, the framing effect was most apparate: giving a magnificent presentation gives a better feeling: “This looks great, my employees will love this”. Next, they analyzed how these biases effect architects. Of course there are many limitations to the results: a small number of participants, so more experiments are required to make better grounded theory. And interesting next questions: how do architects coop with biases? How do they interact with each other knowing these biases? 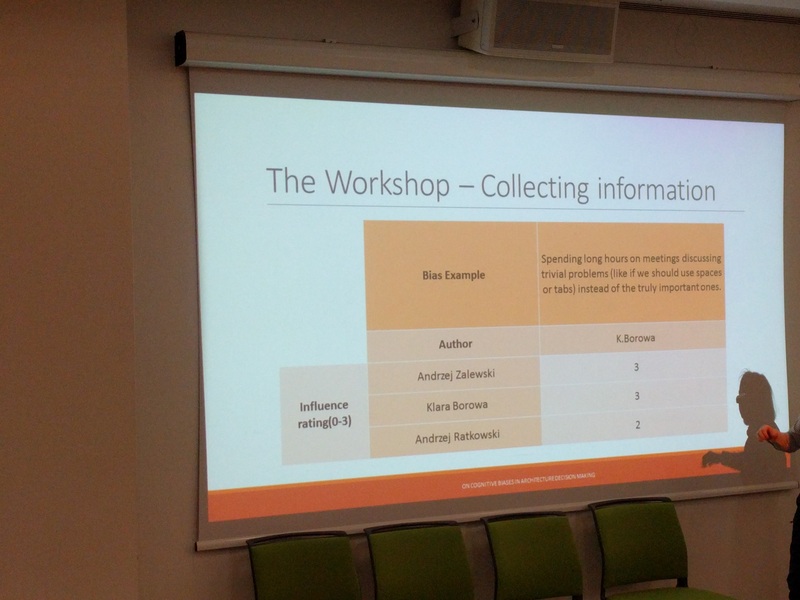 However, one of the main questions is the bias in the study: by presenting biases before brainstorming, how much bias do the workshop participants have in their examples?